These delicious vegan, low-fat cookies are a cross between a gingersnap and a molasses chew. I used date syrup to make them a little healthier, but if you don't have any, I'd substitute with 3 TBS molasses and 1/3 cup maple syrup. Sift flours, baking powder and baking soda into large bowl. Add salt, sugar, and spices, and whisk together to blend. In a blender, combine date syrup (or maple syrup/molasses if using), pumpkin puree, vanilla and water/milk and blend until smooth. Stir wet and dry ingredients until well combined. Roll dough into balls using 1-1.5 TBS dough. Stick one side of the ball in the sugar, place on parchment paper covered cookie sheet, and gently press flat with a spatula (I use a slotted spatula as I like the lines it creates on the cookie). Bake 10-12 minutes. Remove from oven and after 1-2 minutes, transfer cookies to cooking rack. 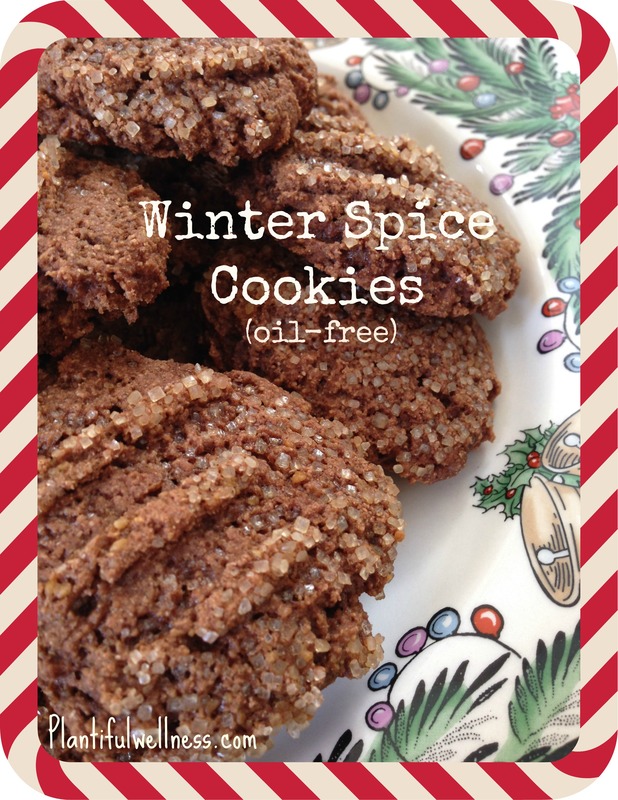 This entry was posted in Blog, Recipes and tagged cookies, ginger, low-fat, oil-free, vegan by Shelly Detken. Bookmark the permalink.